Congratulations to the Following Year End Award Winners! Jake Telford and One Time Rey Jay finish in the Top 5 of the Open Two Rein division. Laura Diebold and Sheza Roo are Top 5 Finalists in the Limited Open Bridle division. Jake Telford & AMR One Shiney Cat take 3rd Open Derby. 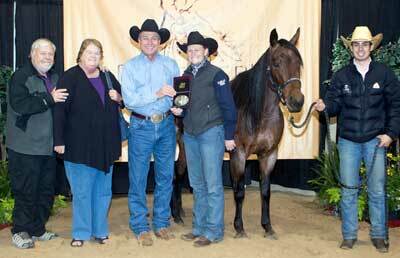 Champions RBR Lady Boon and Morgan Cromer are the $10,000-added 4 Year Old Open Derby Reserve Champions. The pair were also Open Derby Finalists. RBR Lady Boon's earnings from this show put her LTEs over $105,000! With a composite score of 228.5, Jake Telford & Once A Von A Time tied for Reserve Champion in Open Two Rein. Jake Telford & Once A Von A Time, with a composite score of 437.5, tied for 3rd. Jake & Hes Shinettes CD was a Top Ten Finalist with a composite score of 424.0. Todd Bergen and Heza Shiney Kodo finish in the Open L4 Maturity Top 10. Jake Telford and Once A Von A Time finish in the Open Bridle Spectacular Top 5. Morgan Cromer and CD Shines win the Reserve Championship in the Open Derby Finals. Todd Bergen rode Heza Shiney Kodo to 3rd place in the Open L4 Maturity. Congratulations to our first Champions of 2013! 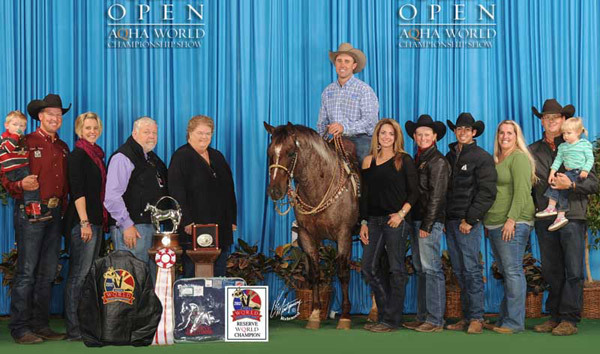 Jake Telford and Nabisco Roan win the Open Two Rein Finals.